Believe it or not, your dog can’t help but pull on the leash. That’s because dogs have what we call “opposition reflex,” which means they pull against pressure. When there is pressure on the front of their neck as they walk, they actually pull against it. It doesn't make a lot of sense to us because we think they should learn not to pull due to the simple fact that they are choking themselves when they do. But they never do seem to learn that and they just keep pulling. To resolve this annoying behavior, your dog needs to learn that pulling (tension in the leash) stops all forward movement, and not until he slackens the leash will the movement continue. So your job is to stop as soon as you feel the tension in the leash and stand like a statue. Don’t say anything, don’t jerk the leash back – just stand there. Once the dog slackens the leash (and he will most likely do so because you have stopped moving and he wonders why) start walking again. Repeat this over and over and soon your dog will learn that pulling doesn’t pay. In addition to this “be a statue” technique, it’s valuable to reward your dog when he is NOT pulling. Randomly, when he is not pulling, tell him he is a good boy and offer him a treat. There are some nice tools available to help with pulling on the leash. One such tool is the front clasping harness (there are many different brands). With the front clasping harnesses, the leash clips to the ring on the chest of the dog. This causes the pressure of the leash when the dog pulls to turn his whole chest side-ways, making pulling more difficult. Even if you choose to use a tool that helps inhibit pulling, you should still work on the training described above. Please avoid the tools that cause pain such as choke chains, pinch collars and shock collars. There is simply no need to inflict pain and discomfort to teach your dog to walk nicely on the leash. Walking your dog is one of the most enriching things you can do for him. It’s not only physical exercise (for both of you), it’s also mentally stimulating for the dog, especially if you let him do some sniffing during the walk. A dog’s most keen sense is his sense of smell, and allowing your dog to sniff things on a walk is like you reading the news each morning. It’s their way of finding out what’s happening in their world. So if you are not currently walking your dog because he pulls too much and its annoying, try the above suggestions so that you both can have a great time strolling down the street on a lovely evening. 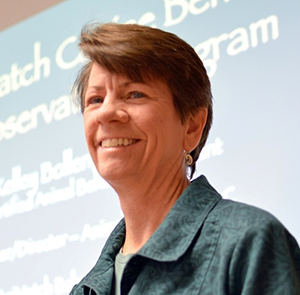 Kelley Bollen is a Certified Animal Behavior Consultant. She lives in Reno.